Almost there. At about this time on Wednesday I should arrive on Islay, assuming everything goes to plan. The plan is to leave after work early in the evening on Tuesday and drive to Carlisle. Stay there over night and continue on Wednesday. On the way I'm hoping to stop at the Crinan Canal for a bit of sightseeing. Then the evening boat to Islay for a late arrival. 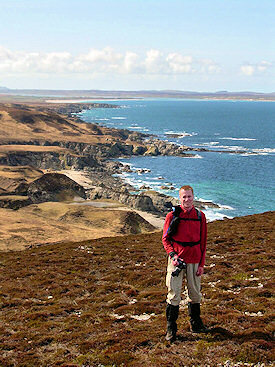 Bascically, as there is no ferry to Colonsay on Wednesday 15th now, James How will not be able to have his walk there. So instead, he will meet with folk at Ardnave at 10 am. The walk initially will go round Ardnave Point, when we get to Traigh Nostaig, there are 2 options available. The easier option is return inland to your car at Ardnave, the other longer option is to continue along the coast to Sanaigmore. When we get to Sanaigmore, Outback Art Gallery will be open for those who may wish to purchase a welcome cuppa of tea, coffee or hot chocolate. Transport will be laid on for drivers to get back round to Ardnave to pick their vehicles up.This longer option can be tough going after Traigh Nostaig on some sections along the coast.Please remember to bring your lunch with you! For those not wishing to go round Ardnave, there is an afternoon walk led by Neil Park starting at 2pm from the Playing Fields in Bowmore. 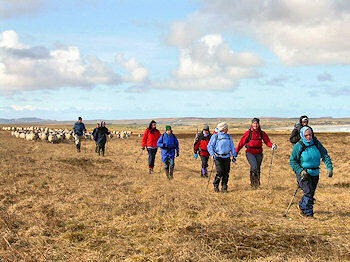 Neil's walk takes in The Battery, and out along the shoreline to Gartbreck, and return along The Moss road to Bowmore. I've made that programme change to the illustrated version of the WalkIslay 2009 programme, so you can download and print the latest version. I've just printed my copy, just to make sure it works. I hope to meet quite a few people from Islay and around the world during the week, there will quite a few old friends I expect to see again as well as many new walkers. I'm sure it will be another great week! I don't know how much time I'll have for blogging while I'm on Islay (let alone an internet connection), but I hope to post at least sporadic updates. There should hopefully be a few pictures on the Islay Pictures photoblog, as well as the odd update here. Just don't expect any regular updates here. I might also squeeze in the odd update on my islayblog twitter account. That's all, bye for now.